Prevention is about stopping problems before they start. This section highlights key starting points to find programs that are effective in educating populations about the hazards of — and ways to avoid — opioid abuse. S.A.F.E. can help your community find targeted prevention solutions for your community, school, or workplace. We know that if we educate teens about the science of the brain and substance use disorder, we can drive down drug use rates. We also know talking to teens in language that resonates can be difficult. The National Institute on Drug Abuse (NIDA) provides free educational tools specifically targeted at teens and covering a large range of topics with scientific facts and engaging images. These tools can be used by educators, faith-based groups, child and youth centers, or any community organization connected with youth. “Drugs: SHATTER THE MYTHS.” National Institute on Drug Abuse. Accessed November 2018. School prevention curriculum can be costly but effective in preventing substance use. Discovery Education, in partnership with the Drug Enforcement Agency (DEA), created Operation Prevention, a comprehensive program to combat opioid abuse, available at no cost to schools. The program includes virtual field trips, parent resources, K-12 tools aligned with English & Spanish language standards, and a toolkit for parents. “Operation Prevention.” Discovery Education and the Drug Enforcement Agency. Accessed November 2018. Civic engagement is a necessary component of effective prevention to change attitudes and norms around substance use. Collaboration among local government officials is a key to prevention success. One model for local government leaders looking to establish or enhance their prevention efforts is the joint report from the National Association of Counties and the National League of Cities, Prescription for Action: Local Leadership in Ending the Opioid Crisis, which provides guidance on how cities and counties can strengthen collaboration with each other and with state, federal, private, and nonprofit partners. The report shows successful practices from cities and counties and provides recommendations your community or organization can use as you work with state and federal officials and nonprofit organizations to expand your prevention efforts. “Prescription for Action: Local Leadership in Ending the Opioid Crisis.” National Association of Counties and the National League of Cities. Accessed November 2018. Focusing on opioid use and its associated dangers is a targeted way to prevent first-time use. Heroin, Fentanyl & Other Opioids: From Understanding to Action is an opioid-focused prevention resource provided by the Partnership for Drug-Free Kids to prevent first-time use through education of children and families. It includes sections on understanding the risks and protecting your family and community from opioids, and it provides access to a variety of presentations that can be used in your community. “Heroin, Fentanyl & Other Opioids: From Understanding to Action.” Partnership for Drug-Free Kids.Accessed November 2018. Determining how to provide culturally appropriate services is challenging for many communities. Yet services that are not delivered within the context of culture often are not successful. The Think Cultural Health Guideand implementation Blueprint from the U.S. Department of Health and Human Services helps communities understand and implement the national standards for culturally and linguistically appropriate services (CLAS). These services are respectful of and responsive to the cultural and linguistic needs of all individuals. Communities can use this guide to make sure prevention programs and initiatives are culturally appropriate — which will make them more effective within the community or population being served. “Think Cultural Health Guide.” Office of Minority Health, U.S. Department of Health and Human Services. Accessed November 2018. “A Blueprint for Advancing and Sustaining CLAS Policy and Practice.” Office of Minority Health, U.S. Department of Health and Human Services. Accessed November 2018. According the CDC Foundation, in 2013, prescription opioid dependence, abuse and overdose cost the United States $78.5 billion. More than one-third of this amount, $29 billion, is due to increased healthcare and substance use treatment costs. Employers have a key role in educating their employees and community about the dangers of prescription drug abuse and preventing use. The Substance Abuse and Mental Health Services Administration funded the creation of a series of fact sheets that serve this end. Communities and advocates can use these materials to educate themselves and to promote prevention by increasing public awareness of the issue. “SAMHSA Fact Sheets on Preventing Prescription Abuse in the Workplace.” RTI International. Accessed November 2018. Communities can engage business stakeholders in being part of the solution by using policies and programs to prevent the non-medical use and abuse of opioids and other drugs, address the issues of substance use within the context of workplace health and wellness programs, and provide prevention and intervention services for employees and their families. The Substance Abuse and Mental Health Services Administration provides a Drug-Free Workplace Toolkit to help employers develop and sustain successful drug-free workplace programs. This kit includes help on how to assess your workforce, implement a drug-free workforce program, and evaluate your program through suggested metrics. “Drug-Free Workplace Toolkit.” Substance Abuse and Mental Health Services Administration. Accessed November 2018. The cornerstone of successful prevention efforts addresses the holistic needs of community members. The first step for many families is understanding what resources they have access to. The Roadmap to Behavioral Health: A Guide to Using Mental Health and Substance Use Disorder Services is a guide from the Substance Abuse and Mental Health Services Administration. It helps individuals understand how to use their health insurance coverage to improve mental and physical health using mental health and substance use disorder services. This resource can help communities and people navigate how to get help and prevent more serious issues from arising. It also serves as a means to decrease the stigma around seeking help for substance use or mental health needs by strengthening awareness of behavioral health as a key part of a person’s overall health. “A Roadmap to Behavioral Health: A Guide to Using Mental Health and Substance Use Disorder Services.” Substance Abuse and Mental Health Services Administration. Accessed November 2018. When people are educated on the science of addiction and how substance use disorder can hijack our brains, it serves to prevent first-time use of substances and to reduce stigma, myths, and misinformation that keep substance use disorders from being treated like any other medical condition. To help educate on this science, the Addiction Policy Forum created a series of two- to three-minute videos that offer educational episodes meant to be consumed like “snack-packs” of key scientific information. These videos can be used for prevention and public education and are short enough to be used in meetings or shared on social media. One of the biggest challenges in prevention is finding and utilizing effective programs that fit the target population and community environment. Finding a program that “fits” the target group, culture of the community, and setting is key to expecting the same success with the program. Evidence-based programs are evaluated to be successful when delivered with the appropriate “fit.” This resource includes several tools to help find programs that work and are appropriate for the setting and demographics where they will be used. The Substance Abuse and Mental Health Services Administration has an online compendium of resources to help identify evidence-based prevention programs, practices, and policies. “Evidence Based Practices Web Guide.” Substance Abuse and Mental Health Services Administration.Accessed November 2018. Programs to prevent drug use should be rooted in established principles, supported by research and evidence. These principles are critical to ensuring the prevention effort will have impact on substance use behavior for youths, not just “feel good” to the school or community leading the effort. The National Institute on Drug Abuse has leveraged its decades of experience in prevention programs to create a list of guiding principles, developed through years of research, to identify elements of effective prevention programs and initiatives. These principles are relevant to child and adolescent programs, parents, educators, and community leaders. These principles should be used to plan, select, and deliver prevention in the community. “Lessons from Prevention Research.” National Institute on Drug Abuse. Accessed November 2018. 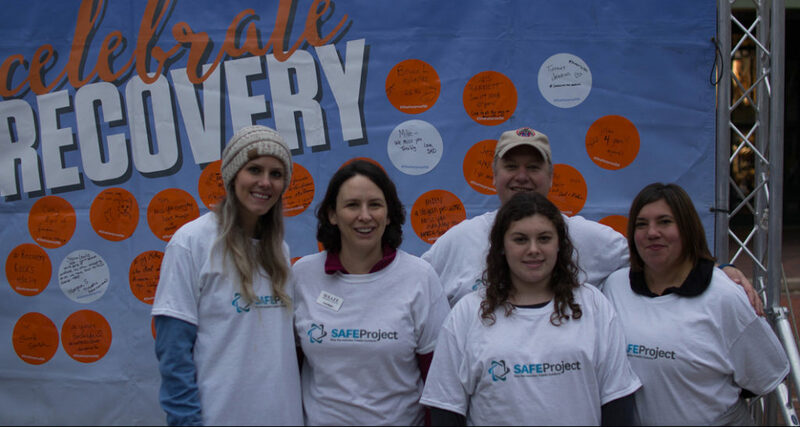 There are many common goals in the efforts of prevention and recovery — both aim to create a community environment that supports healthy, drug-free youths. S.A.F.E. is working with communities, using a framework and hands-on tools to build a youth-recovery-friendly community. This cultivates protective factors against initiation of substance use and provides a roadmap for communities to stand up youth-focused initiatives, such as Recovery High Schools, that support long-term recovery. To learn more, email us at contact@safeproject.us. The most valuable resource a community has is people with lived experience, those who have been touched by addiction. These community members have incredible stories to tell that educate their neighbors on the far-reaching consequences of the opioid and addiction epidemic. Communities should organize these peer-to-peer presentations, which will have the most powerful impact and can rely upon the individual experience of the peer as well as the best practices we have learned from other thought leaders. S.A.F.E. is building a network of speakers in communities, trained and ready to assist with peer-to-peer presentations at no cost to talk about stigma, signs of addiction, and the opioid crisis. For more information, email us at community@safeproject.us. Public restrooms are a common place for people to take drugs in private, making them an ideal place to influence an individual’s last-minute decision. Messages regarding drug use could serve as the prompt they need to seek help or, at the very least, not to use alone. Place a one-page flier in community restrooms (behind stall doors, above sinks) that reads: “Will you be the next overdose victim of [insert county name] county?” followed by local statistics, emergency phone numbers, and local contacts (treatment facilities, shelters, needle exchange locations, etc.). Invite a local community member or subject matter expert to deliver a few short remarks before the National Anthem about the dangers of opioid use, how it affects a young brain, and a call to action. The call to action can be sharing content on social media, encouraging individual outreach and engagement, or promoting an upcoming event. A resource table outside the gymnasium can provide information on the specific dangers of drug use and how to talk to kids about drugs. This is a low- to no-cost engagement with students and families at an event already highly charged with engagement. As part of a larger strategy, this strategy has lingering positive effects. Gather local faith-based leaders as a Church Council on Opioids, and choose a Prayer Day, when all denominations pray for those who have died by opioid overdose, as well as those who are in recovery and their families — a community-building and healing event that engages, educates, and lowers stigma. For maximum impact, the announcement should start one month before the date, and the collateral should look the same across all faith-based organizations, with customization of the faith symbol only. The Prayer Day can take the form of one minute of silence or the ringing of bells (as available) and should include a call to action such as sharing content on social media, encouraging individual outreach and engagement, or promoting an upcoming event. Resource tables at the faith facility can provide information on the specific dangers of drug use, how to talk to kids about drugs, local treatment options, and how to dispose of opioids.